If you liked The Killing's first murder mystery, despite being drawn out for two seasons, then you, my dear readers, are in luck. AMC and Fox Television Studios have reached a new agreement to bring The Killing back for a third season. This time around, exec producer and Danish series adaptor Veena Sud returns to helm the third season. 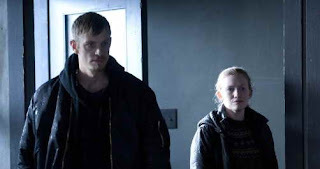 Also Mireille Enos and Joel Kinnaman will be returning. And yes, the showrunners have learned their lesson in a big way when fans got pissed at the first murder case dragged out over two seasons. That second season was about 70% fluff and it felt annoying. This third season of The Killing will be a 12 episode run, and the murder case will be contained and be solved when the season ends. So it's official, I will look forward to the upcoming third season and production begins on February 25th in Vancouver. "A year after closing the Rosie Larsen case, Linden is no longer a detective. But when her ex-partner Stephen Holder’s search for a runaway girl leads him to discover a gruesome string of murders that connects to a previous murder investigation by Linden, she is drawn back into the life she thought she’d left behind." There's still some negotiations going on in the background with Netflix to air the show.